ELSA possible fuel flow fix??? With that being said, has anyone that converted to ELSA thought of installing a fuel shut off right next to each each wing where the pickup comes out? I know aircraft spuce has them relatively cheap and it seems if you installed one on both sides, then you could control fuel level by shutting off the tank that was lower on fuel and force the engine to pull from the other tank. Correct??? Maybe??? i know some will say it’s not necessary and have comments the don’t pertain to if it would actually work. I’m more interested if anyone has a reason it would not work or they don’t think it’s a good idea because of a safety issue???? Not it trying to start an argument or debate with it. I just think it would make me feel better if I ran my tank low and the other side had a lot left, if I was able to shut that side off that was low on fuel and save a little that way I could have both tanks open and be able to get fuel from both while landing. I don't think this is wise, personally. It leads to a complex fuel system that has three valves (the on/off fuel valve and now one for each tank), all of which can fail and one of which is clear across the cockpit from the pilot. 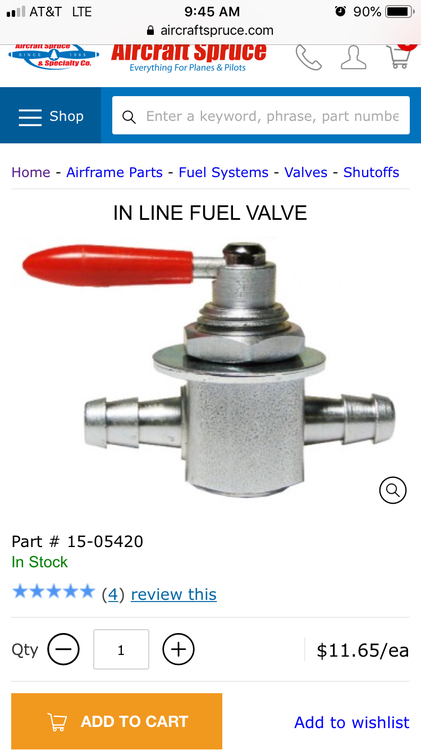 If you forget to open a valve and run the only active tank low, it would be very easy to unport the active tank and cause an unintentional engine stoppage. If the active tank was the left, now you have to lean across the cockpit to get to the valve to correct the situation, all while trying to manage glide speed. If that happens at the pattern, at low altitude or airspeed, you could be in an off airport landing situation very quickly. When I went ELSA I looked into replacing the simple on/off fuel valve with a left/right/both valve. One issue is there is no good place on the panel for it that makes logical sense with the fuel line routing, so you'd probably need to move it to the side of the tunnel or the mushroom by the pilot's leg. That means it would have to be manipulated by feel and you could not visually verify the position...not good. In the end I abandoned the idea; the CT fuel system is very simple, and is designed to make sure the engine always has fuel, right up to the point of running both tanks empty. That's a good thing. The fuel flow from one tank or another is easily managed with the rudder trim wheel, so the need for a fuel system to manage that aspect is kind of unnecessary. After flying this airplane for five years, managing fuel on long flights using the trim method has become second nature, and is very predictable and accurate. Besides there is not really enough room for a valve in the wing root, at least not without a lot of modification. There is only about 3/4"between the end of the fitting coming out of the wing and the edge of the opening. Also there have been plenty of accidents from improper management of fuel due to incorrect usage of fuel valves. I understand those concerns. When I purchased the plane I got the idea that it’s safest to make sure to leave about 5 gallons in each side for safe measure. It just seems like so much fuel to leave on the table. In a cross country you could easily go another hour and still have one hours reserve. I wish they had a selector valve for left/right/both. It just don’t seem that feasible. When flying with full tanks note which side you see a level on first and how even / uneven they are. This is at the 2 hour mark and gets you started managing if necessary. Confirm your ball - using rudder move the level in one tube up and down and decide where middle is, this is where ball should be centered. when critical, if you can see fuel so can your engine. My advice . . . . don’t fix something that ain’t broke. Learn to manage the fuel system you have. It will be cheaper and safer. If you manage the fuel and keep fuel in both tank then you can go below 5 gallons each side. The problems start when one side is empty and you have just 5 in the other side. The 5 gallons that you have left can be un-ported in that tank. If you can keep fuel even you can go down to 5 gallons total or less and not have issues. With 2.5 gallons in each side you will not have an issue with un-porting a tank. Personally I have landed with 5-6 gallons left total by using the method above. That is not much fuel left visible in the sight tube. Its possible to unport and starve the engine, I know because I did it once in a steeply banked slip photographing a high ridge. A couple of guys have done it inadvertently and landed as a result so you can do it while unaware its happening. I with the others. Leave well enough alone. Leaving 5 gallons on each side isn’t leaving much on the table. I plan 5 gal. reserve which is about 1 hour. That means you have an extra 5 gallons. If you can fly with full tanks that is 32 gallons. 32-10=22 or about 4.4 hours of flight. I don’t know about you but I do 2-3 hour stints = 10-15 gallons. You new guys have to quit chasing the fuel flow from tank to tank issue. This is a design of flat fuel tanks. It happens in the GA world to. It is also a function of an instrument console not being perfect in the cockpit and the instruments not perfect in the console. Fuel valves are not a fix and have caused more crashes than having a tank drain faster than the other. It just isn't hard to pay attention to your fuel and not trying to cut fuel to the last mile. If you run out of fuel in a tank it isn't a system failure it's a pilot failure. I agree with everything said here... but I don't think anyone mentioned the most important thing (or directly answered your question): Unless your aircraft has a header tank with a low fuel level alarm, shutting off one of the tanks in flight is unsafe because of the risk of fuel starvation resulting from subsequent, sustained, uncoordinated flight with the ball toward the active wing. This applies whether the shutoff device is at the wing root or is a right-left-both fuel selector valve in the console. This issue is somewhat unique to CTs in that their wings have very little dihedral (this is not an issue at all in a Cessna, for example). As a result, the amount of miscoordination involved is relatively minor. Momentary miscoordination, such as in turbulence, or short duration miscoordination, such as in a distracted turn, is not an issue as the fuel system plumbing between the tanks and engine has some significant fuel capacity. But the issue is exasperated in cruise during calm conditions in an aircraft that has rudder and alerion trims, or an autopilot, in that these devices may allow a sustained uncoordinated condition. Hand flying or turbulent conditions mitigate the risk by adding a degree of randomness which may intermittently interrupt the sustained uncoordinated condition and refill the fuel lines from the wing toward the ball. Shutting off one of the tanks is just like letting one run dry. Unless you conscientiously keep fuel at the wing root of the other wing, you risk fuel starvation. The best approach, of course, is to keep at least a little fuel showing in each wing when the ball is centered. This is not much of an inconvenience. After 4 or so hours of flight you center the ball a check the amount of fuel in each wing. If one is low, move the ball a little bit (Roger says half a ball) toward that wing and fly like that for a while, returning the ball to the center to check your progress every few minutes. Once both wings show sufficient fuel, go back to flying as you were and check them again in another hour or so. In this manner you can run both tanks down to where just a tiny bit of fuel is showing in each sight tube when the ball is centered. In my plane I think this still leaves a least a gallon and a half in each side. If l don't see fuel in both sight tubes with the ball centered, I am already on the ground (I have never let this happen). My post made it sound like I don't like alerion and rudder trim or autopilots. That's not the case. My CT didn't come with these features, but I wish it had. And though they could exacerbate the fuel starvation due to uncoordinated flight condition, they could also make it a lot easier to hold the ball over to one side for a while. I was really hoping for a good explanation like that though so I could put all together. I figure asking questions like that and getting feedback is going to be the best way to become more familiar with the systems that I don’t quite understand why they are the way they are. I hadn’t thought of it not having a header tank and how that would affect it. If you run out of fuel in a tank its a non-event. If you run out of fuel in the other tank too its a pilot failure. The good news is that we have 34 gallons of fuel capacity, more than any other LSA except the Sling (I think). That means we have a lot of range, and no excuses for running out of fuel. As an example, last year I flew from the Atlanta area (KWDR) to Suwanee Belle (9FL0), a distance of 235nm. I left with about 30 gallons of fuel. I flew down, spent the day, and flew back that afternoon. Never put a drop of fuel in the airplane, and landed with 8 gallons remaining. I watched it carefully on the way back and would have stopped for fuel if needed, but it wasn't. I just used rudder trim to keep the tanks roughly level, that was it. Most other LSA have 20 gallons of fuel capacity, and just can't do that. That's one of the reasons the CT is such a great travel airplane. I guess my point is the airplane will outfly your bladder capacity, so just put plenty of fuel in for your intended flight, keep the tanks roughly even, and you can put the rest out of your mind. Entirely circumstances dependent! I can think of some situations where it would be a major f*@!^# event. To my mind its the prolonged unporting of the tank with remaining fuel that's the major event. I often fly with an empty tank, that alone is a non-event. I'm very new to flying CTs, but isn't it as simple as flying as coordinated as possible, manage the fuel balance levels as described above and then if/when your tanks get very low, rock the wings every few minutes. I've made a note that when I'm in circuit (and therefore always flying turns in the same direction) to do a bit of a rock each leg. The pipework from wings to engine has some capacity (effectively a small header tank), rocking the wings should keep at least one side of these full and as long as one side always has fuel in, all is ok.
Or have I grossly misunderstood something? As I said, I'm new to the CT and very keen to learn. Now the guy with the header tank is rocking the wings every few minutes because the turns in the pattern are all the same way??? You guys are way overthinking this. I'm very new to flying CTs, but isn't it as simple as flying as coordinated as possible, manage the fuel balance levels as described above and then if/when your tanks get very low, rock the wings every few minutes. My point was that with 34 gallons your tanks should never both get very low. In five years I have never landed with less than 6-7 gallons, and when it gets less than ten total I always make sure to keep the tanks roughly level. My opinion of course, YMMV.